Fresh, crisp, sweet and green! This heart-healthy kiwi salad is tossed in a honey-lime vinaigrette. 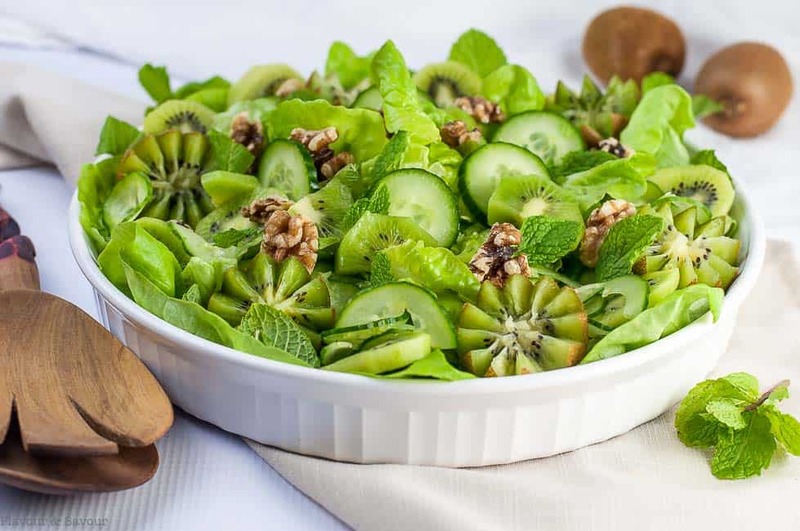 This Kiwi Cucumber Salad is definitely green, but it’s certainly not a typical “green” salad! 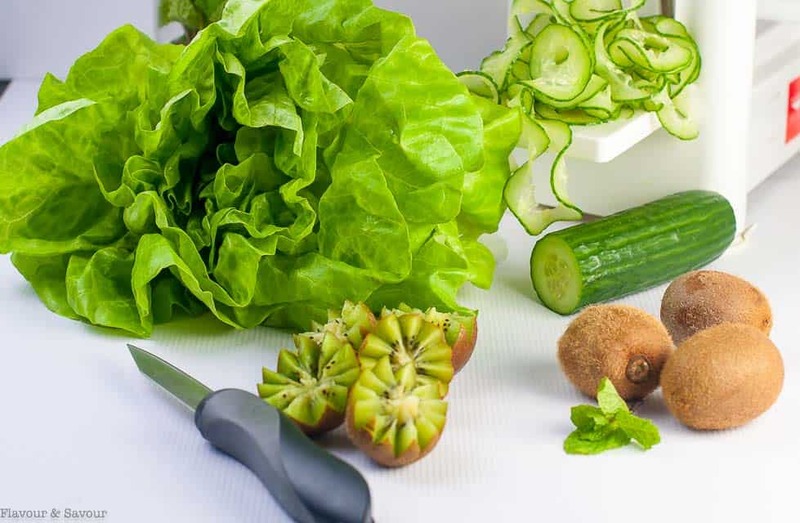 Tender butterhead lettuce leaves topped with sweet kiwi and thinly sliced crisp cucumbers make the base for this refreshing salad. Walnuts and fresh mint leaves add a punch of flavour. 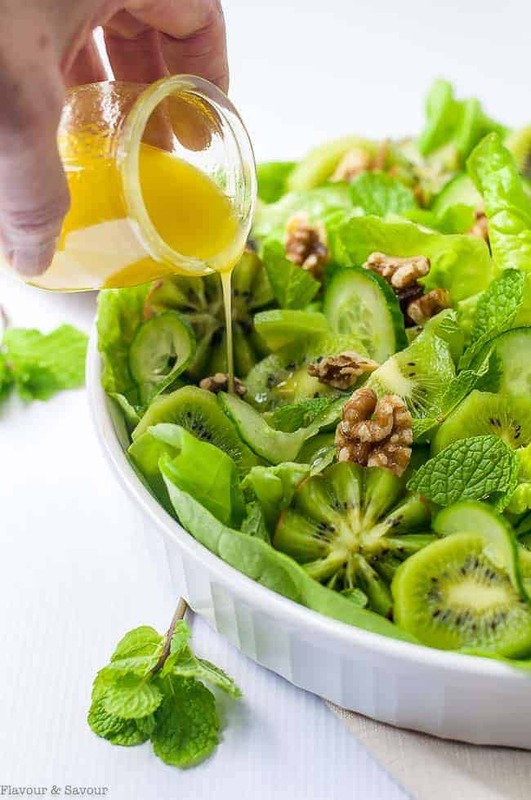 And there’s more to enjoy: this kiwi salad is tossed with a honey-sweetened lime vinaigrette! I’ve always known that kiwi fruit are a good source of Vitamin C, but I wasn’t aware of all the other benefits of this fuzzy little fruit. While our kiwifruit usually come from New Zealand or California, occasionally it’s imported from Italy. Sweet, firm and juicy, and absolutely perfect! I learned that two kiwifruit contain as much potassium as a banana, and twice as much Vitamin C as an orange. They are an excellent source of fiber, even if you don’t eat the skin (which is NOT weird in your mouth and is fine to eat as long as you wash it first). 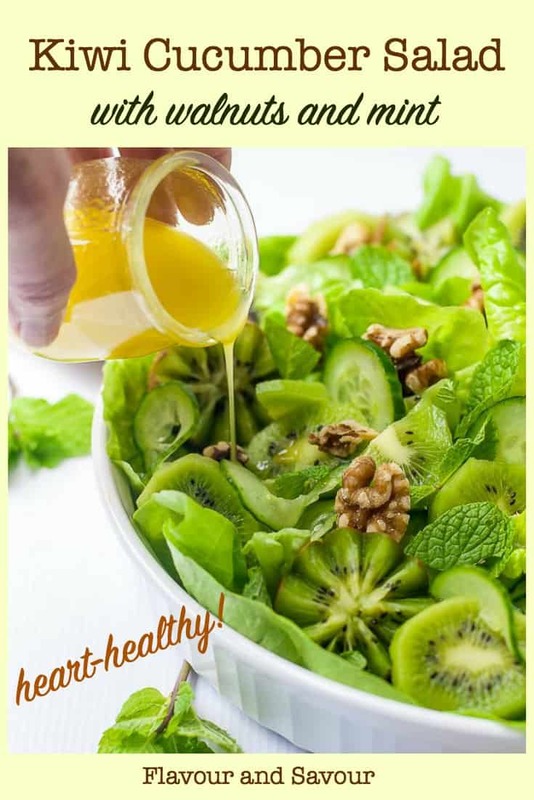 Eaten regularly, kiwifruit is a heart-healthy choice as it can thin the blood and reduce blood clotting and lower triglycerides. Not only that, it is also a good source of magnesium. All good reasons to pick up a few next time you shop! Ready to make this kiwi cucumber salad? Here’s what you’ll need. Wondering how to cut kiwi fruit into flower shapes? It’s easier than you might think. Here’s a video to show you how. Begin by washing and drying the lettuce. Slice the cucumber very thinly and pat dry to remove excess moisture so they stay crisp. Cut the kiwi fruit. Slice some and carve the rest into flowers. Combine the salad ingredients in a large bowl or shallow serving dish. Garnish with walnuts and mint leaves. Drizzle with Lime Vinaigrette just before serving. This Kiwi Cucumber Salad makes a good potluck offering. We like it as a side salad with Easy Baked Lemon Chicken or Maple Garlic Glazed Chicken. You might also like this Kiwi-Mandarin Spinach Salad with Creamy Avocado Dressing! Looking for more ways to add heart-healthy walnuts to your diet? Try these oh-so-good Gluten-Free Maple Walnut Squares for dessert! 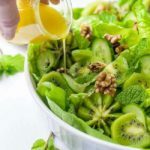 This Kiwi Cucumber Salad with Walnuts and Fresh Mint is definitely green, but it's not your typical green salad! 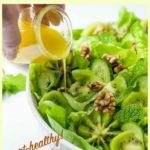 Tender butter lettuce, crisp cucumbers and heart-healthy kiwi fruit are drizzled with Lime Vinaigrette in this tasty salad! Wash, dry and tear lettuce leaves and arrange in a serving dish or on 4 plates. Slice cucumber very thinly, using a sharp knife, a mandoline slicer or a spiralizer. Pat dry with paper towel to remove excess moisture. Add to salad. Peel and slice 2 kiwi fruit and add to salad. 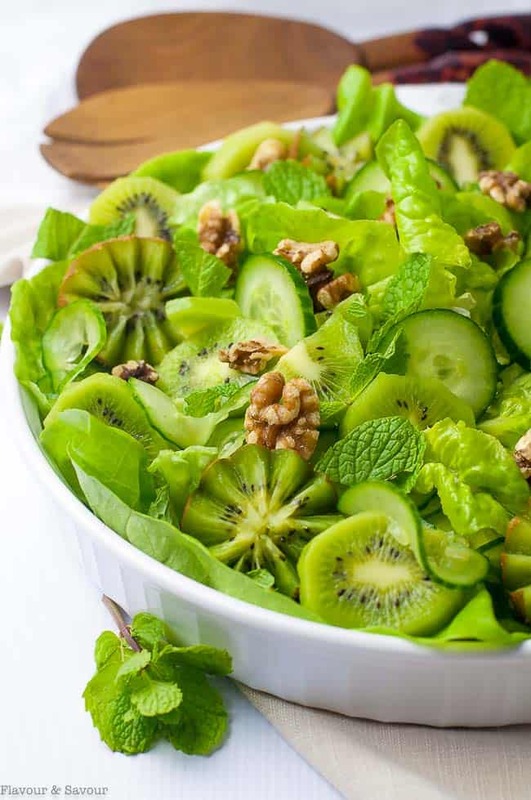 Carve the remaining kiwi fruit into flowers and add to salad. Top with walnut pieces and fresh mint leaves. Those kiwi flowers look complicated but I tried them and they’re so easy! We loved the mint in this salad.